The MAN A95 (ND323F / ND363F) is a fully-low-floor rear-engined double-decker transit bus chassis built by MAN Truck & Bus. 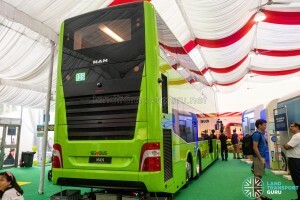 As part of the MAN NDxx3F line of bus chassis, they are built only for right-hand drive markets. 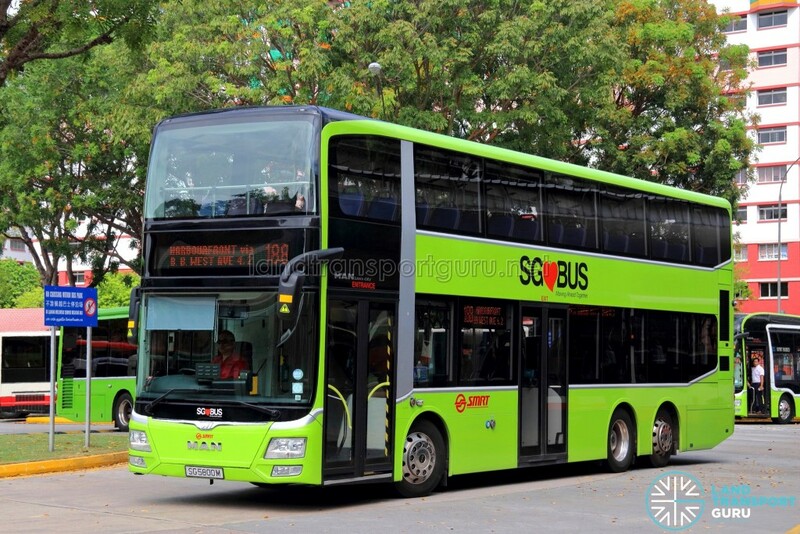 SMRT Buses was the first local public transport operator to bring the MAN A95 to revenue service with a single demonstrator unit brought in for evaluation, followed by 16 more production batch units registered in late Aug 2015. Additional units have since been procured by the Land Transport Authority (LTA) under the Bus Contracting Model (BCM) and were registered with the SG-prefix. All MAN A95 units operating in Singapore are of the ND323F make. In addition, a one-off concept bus was built for public showcase, and entered service with Tower Transit under a six-month trial. 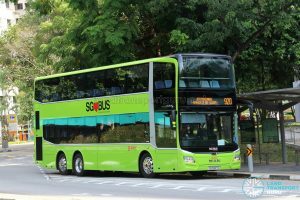 In July 2017, SBS Transit received its first MAN A95 bus under its fleet, registered as SG5835M. 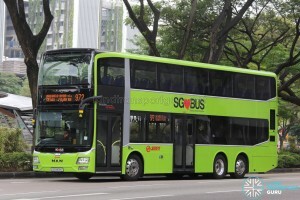 The first Euro VI MAN A95 was registered SG2017C and entered service in December 2017. 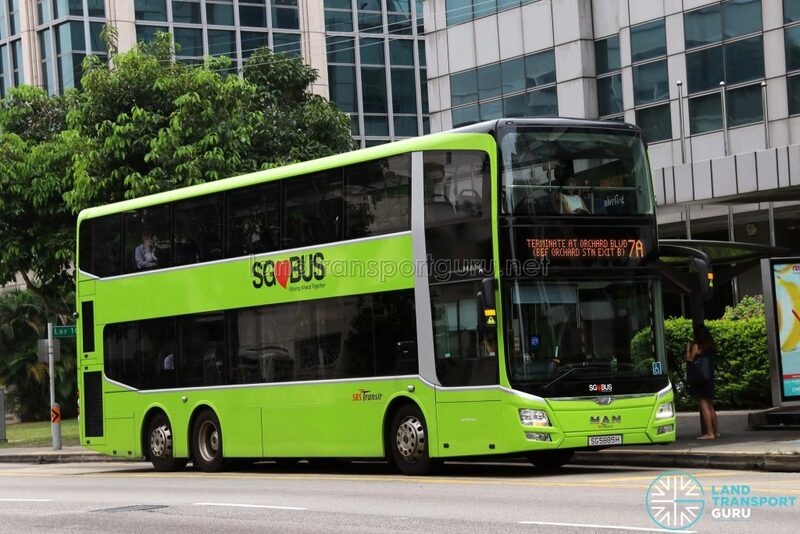 In January 2018, Go-Ahead Singapore received its first few MAN A95 bus under its fleet, registered as SG5914T & SG5915R. 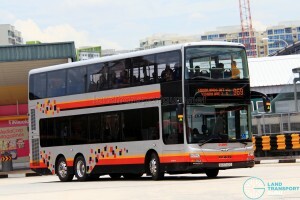 The Land Transport Authority (LTA) has also initiated purchases of Euro VI (Euro 6) MAN ND323F buses in 2018, as part of Contract PT337 – Procurement of 250 MAN Buses. 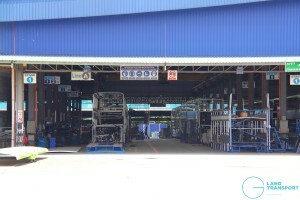 (See MAN A95 (Euro 6) – First Production Batch). 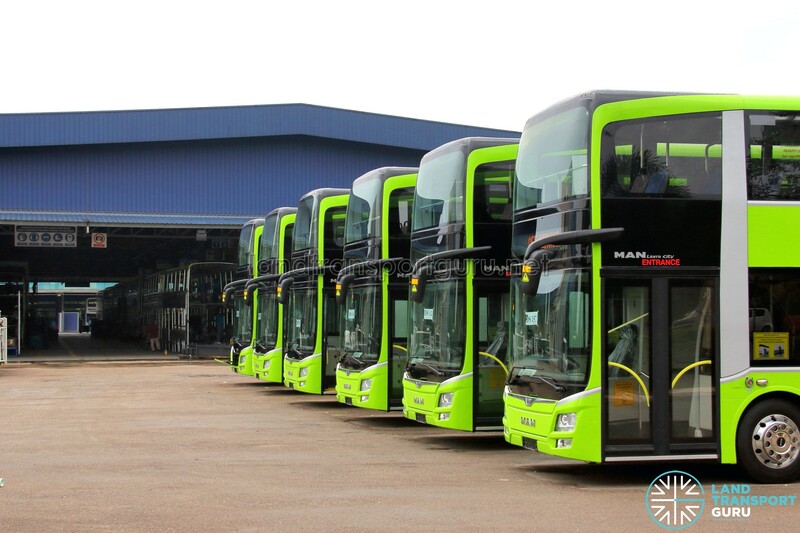 On 11 July 2018, ST Engineering Land Systems Ltd was awarded the tender (PT322) for Euro 6 111 Double-Decker buses, which will likely see more MAN A95 buses delivered to the Singapore market. The MAN A95 is a chassis designed off MAN’s popular urban bus line, the Lion’s City, which was only available with integral bodywork by MAN. The A95 is compatible with various bodywork designs from other manufacturers. While the original MAN A39 is available as a 13.73-metre left-hand drive (LHD) bus with integral MAN Lion’s City DD bodywork, the A95 is a right-hand drive (RHD) model shortened to 12 metres and without room for a third door located at the rear overhang. Delivered with the integrated bodywork from MAN, both the A39 and A95 can be referred to as the MAN Lion’s City DD. Alternatively, the MAN A95 is designated as either the MAN ND323F or the MAN ND363F, to differentiate engine outputs of 320hp or 360hp respectively. The “D” in ND323F or ND363F refers to Doppeldeckerbus, or double-decker bus. MAN A95s come with the standard MAN D2066 LUH inline 6-cylinder, horizontally-mounted, turbocharged & inter-cooled engine, with a range of available power outputs of between 270 and 400 horsepower over Euro III to Euro V emission standards. For the Euro V rating, 320hp, 360hp, and 400hp versions are available, along with a 2-stage turbocharger for high torque rating. The engine uses Exhaust Gas Recirculation (EGR) technology and MAN’s own PM-Kat® exhaust treatment system to achieve its Euro V rating. The Euro VI version is also fitted with a Euro VI-rated MAN D2066 LUH engine, which combines Exhaust Gas Recirculation (EGR) with Selective Catalytic Reduction (SCR) technology. MAN’s SCRT exhaust gas after-treatment system combines catalytic converters and associated sensors to optimize the SCR process. For transmission, the MAN A95 offers a ZF EcoLife 6-speed automatic transmission with integrated hydraulic retarder, featuring greater operating economy, longer service life, and higher temperature resistance for operation with Euro V compatible engines. Similar to other MAN urban buses, the ND323F chassis is manufactured and assembled in Salzgitter, Germany, with engines produced in Nuremberg. 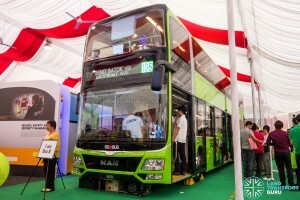 The MAN A95 may indicate MAN’s renewed interest in entering the right-hand drive market for double-decker bus chassis. Their MAN 24.310 model built for the Hong Kong market (around Year 2000) had seen slightly under 50 units being purchased and put into service. Franchised bus companies Kowloon Motor Bus, New World First Bus and New Lantau Bus Co. have received MAN A95 units in 2015. Additionally, open-top MAN A95 units saw service with private operators as sightseeing buses. The State Transit Authority of New South Wales also purchased MAN A95 buses for Sydney’s B-Line, a new bus rapid transit network which opened in 2017. 2018 (11 Jul): ST Engineering Land Systems Ltd awarded tender (PT322) for Euro 6 111 Double-Decker buses. The making of a bus – MAN Lion’s City DD. For a detailed write-up with more pictures, check out The making of a bus – MAN Lion’s City DD. 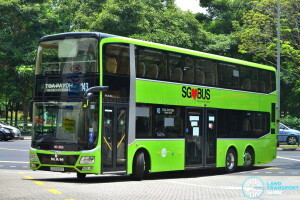 In 2014, SMRT Buses brought in a MAN A95 demonstrator unit for road testing and evaluation from MAN’s local dealer, ST Kinetics. 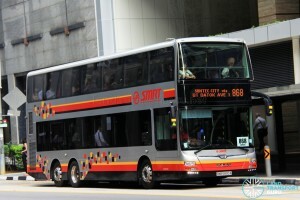 The bus bore SMRT’s new pixel livery and the registration SMB5888H, registered on 01 October 2014. Exhaust Gas Recirculation (EGR) technology and MAN’s PM-Kat® exhaust treatment system, hence doing away with the need for diesel exhaust fluids. Meets the Euro V emission standard. Chassis built in Germany, MAN’s Lion City DD bodywork supplied and assembled by Gemilang Coachworks, licensed by MAN. 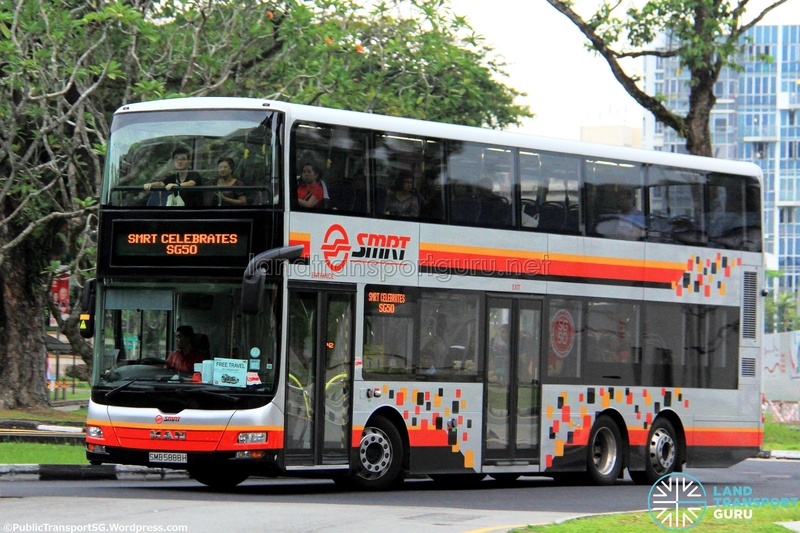 SMRT first announced its purchase of 201 new double-deck buses in March 2014. 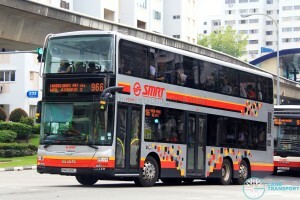 Following the large intake of Alexander Dennis Enviro500 units, SMB5888H is the second model of double deck bus brought in by SMRT, with a single unit brought in for evaluation purposes. 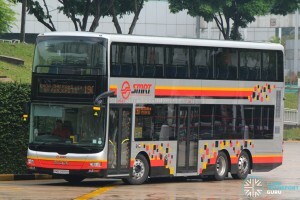 The first announcement was made over SMRT’s official Facebook page on 25 Sep 2014, reporting that the bus was brought in for trial at the manufacturer’s request, for a year’s duration. 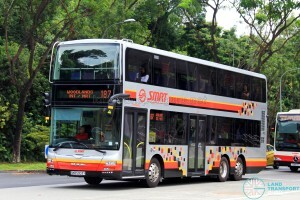 This was part of SMRT’s ongoing effort to test out new bus models. 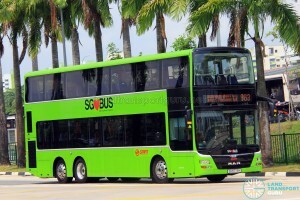 Similar to SMRT’s MAN NL323F buses, the bodywork was supplied and assembled by Gemilang Coachwork Sdn Bhd of Malaysia, licensed by MAN. The A95 chassis is modified from the original 13.7-metre A39 chassis which the bus (and its integral MAN Lion’s City DD bodywork) was previously available as the only option. 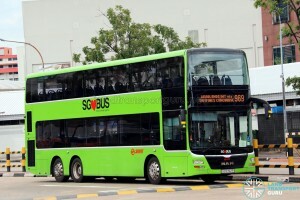 The bus is Gemilang’s third double-deck transit bus in Singapore after SBS Transit’s Scania K310UD and Volvo B9TL prototype bodywork units, and thus very likely assembled at the Gemilang production/assembly plant at Senai, Johor Bahru. The vehicle was registered on 01 October 2014 as SMB5888H. 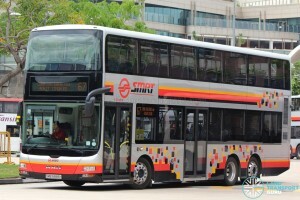 The bus featured Ster NewCity seats (similar to SBS7777Y), leaf doors (entrance) and sliding plug doors (exit) supplied by Masats, and adjustable ball-type air-conditioning vents. Electronic Destination Signage (EDS) was supplied by Aesys Libra (fitted with an Aesys KC640-USB controller), a new addition to the standard models of EDS units used on SMRT buses. It was replaced by a conventional Mobitec MobiLED unit in May 2016, in standardisation with the production batch MAN A95 buses. 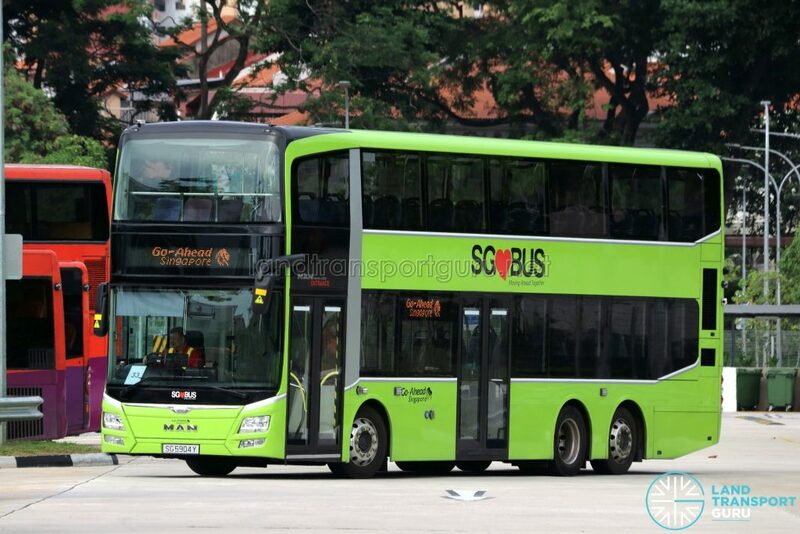 SMB5888H made its revenue service debut on Wednesday, 5th November 2014, appearing on Service 190 (slot 190AP19) which additionally performs Short Trip Service 190A during the morning peak hours and a mid-route departure from Orchard Road (YMCA) towards Choa Chu Kang at night. Allocated to Kranji Bus Depot, the bus has appeared on numerous other services such as 61, 67, 106, 176, 188, 700/A, 868, 972, 983 and 985 as of Sep 2015, in part due to overzealous dispatchers at Kranji Depot. SMB5888H had its original Aesys Libra Electronic Display Signages (EDS) replaced with a conventional Mobitec MobiLED in May 2016, similar in appearance to the production batch buses. 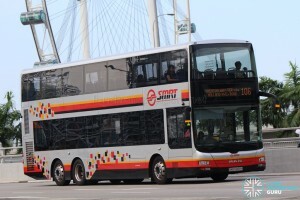 A further purchase of sixteen Production Batch MAN A95s was initiated by SMRT Buses to increase its double-decker bus fleet, and in part due to the satisfactory trial of SMB5888H. These buses were registered between 31 August 2015 and 30 November 2015 as SMB5889E – SMB5904U, in numerical continuation after the demonstrator unit. Additional Tree Guards mounted on upper deck. 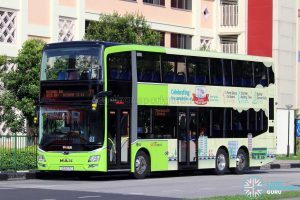 The Production Batch buses featured aesthetic changes such as a redesigned front and rear, including the addition of daylight running LEDs below the headlights, and a rearrangement of various components like the battery box and fuel tank. 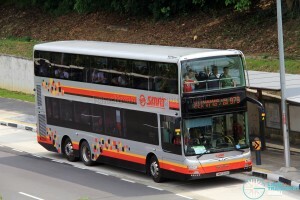 These buses feature Mobitec MobiLED electronic display units similar to many other SMRT buses, along with tree guards on the upper deck, and Vogelsitze System 750/3 seats standardised with the MAN A22, MAN A24 and Enviro500 buses. The first unit, SMB5889E, was registered on 31 August 2015, and was a ‘design prototype’ for the next fifteen units. The battery box is now housed below the bus driver’s compartment seat, like the MAN A22 buses, instead of below the staircase on SMB5888H. The fuel tank has also been moved from the rear axle to the staircase area. Starting with SMB5889E, the MAN A95 buses have an auto-shutoff feature which shuts down the engine after 5 minutes of idling in N gear. Allocated to Kranji Bus Depot, SMB5889E made its revenue service debut on Monday, 7 September 2015, appearing on Express Service 868. Following which, it was deployed on Service 700 on Tuesday, 8 September 2015. The first of MAN A95 production batch buses (SMB5890A & SMB5891Y) were registered on 12 Oct 2015. These two buses made their revenue service debut on Thursday, 16 October 2015, on Services 188 and 190. These were followed by the remainder of the MAN A95 production batch. 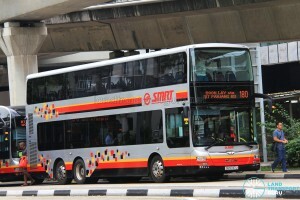 Main Article: New MAN A95 buses for SMRT and Buses with USB Charging Ports Hit The Roads! As part of the Bus Contracting Model, a further purchase of sixty (60) more MAN A95 buses were purchased by the Land Transport Authority (LTA). 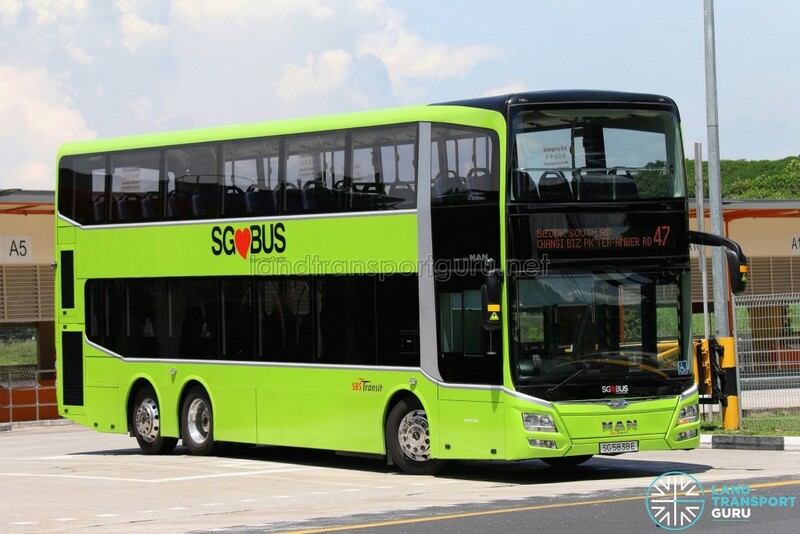 These buses were registered between 14 April 2016 to 19 August 2016 as SG5740C – SG5799J, the first SG-plated MAN A95 buses. 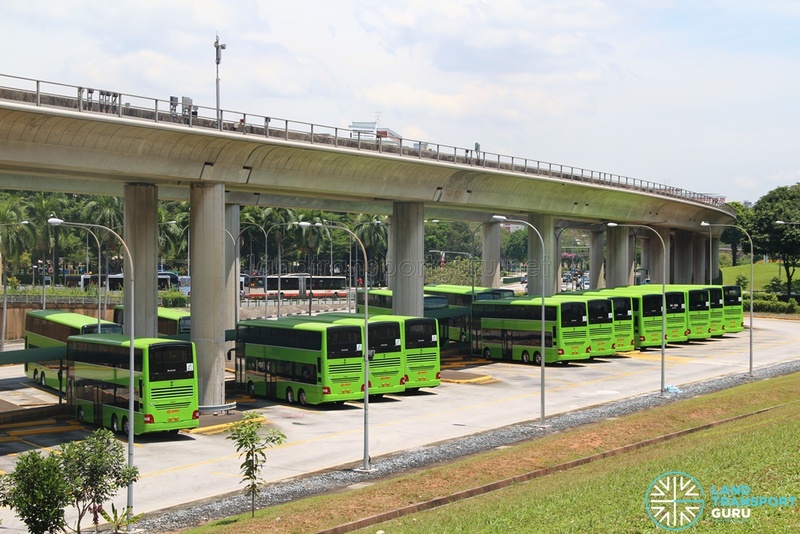 These buses feature the exact same technical specifications as their SMRT counterparts, but without tree guards on the upper deck. Buses registered SG5790H onward are equipped with USB Charging Ports. 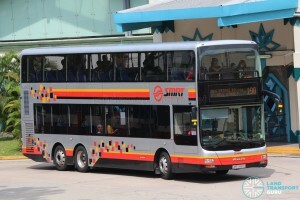 At launch, all Batch 2 MAN A95 buses were leased to SMRT Buses for revenue service operations, to make up for the shortfall of double-deck buses after BSEP-registered Enviro500 buses were absorbed into the BCM bus pool and subsequently transferred to Tower Transit. Also for reasons unknown, a Bright Red MAN A95 was delivered to Singapore before being repainted. To further increase the Bus Contracting Model bus pool, the Land Transport Authority (LTA) purchased a further 122 more MAN A95 buses. 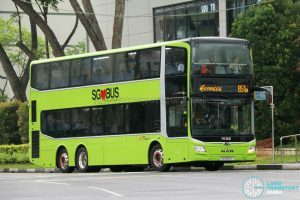 These buses were registered as SG2017C, SG5800M – SG5920A from 2 February 2017, with registration completed on 27 December 2017. 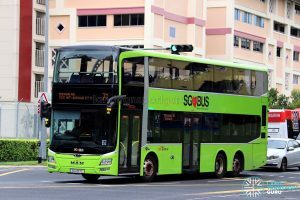 Also delivered with this batch is SG2017C, which commemorates the conclusion of the 5-year Bus Service Enhancement Programme (BSEP) initiated in 2012. It is the 1000th bus to be delivered under the BSEP, as well as the first Euro VI Diesel Public bus in Singapore. The exterior styling of the bus bears new styling elements, most notably the large grey stripe on both sides of the bus. The bus also adopted modifications to the head and rear design, such as larger headlights and a brand new rear design. A similar face-lifted design was used on LTA’s prototype MAN Lion’s City DD Mock-Up, which was first showcased in March 2016. 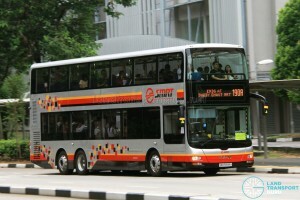 Buses registered after SG5835M received a modified rear design. The interior of the bus is very similar to the Batch 2 buses, but with plastic covers over USB Charging Ports, preventing the accumulation of dust and minimising the risk of accidental damage. 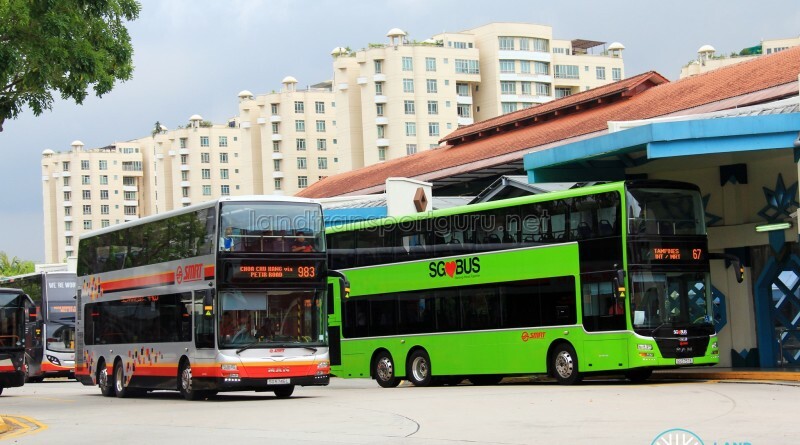 The first two units from this batch, SG5800M & SG5801K, were registered on 2 February 2017 and leased to SMRT Buses upon registration. On the evening of 14 February 2017, the first two units of the Batch 3 MAN A95 (SG5800M and SG5801K) buses made their revenue service debut on Bus Service 190 and Bus Service 972 respectively. SBS Transit received its first MAN A95 bus registered as SG5835M on 20 July 2017. The bus features an automatic wheelchair ramp at the rear door. 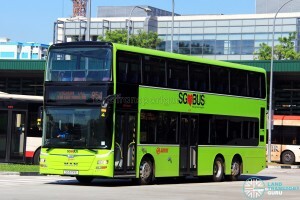 The RT1 Dual Telescopic Ramp is supplied by Spanish company Masats (who also supplies the door systems for the MAN A95 buses) and is electrically operated. 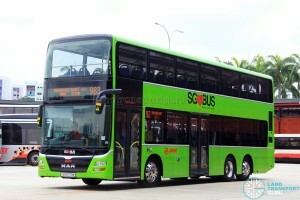 Check out Launch of SBS Transit MAN A95 with Auto Ramp. 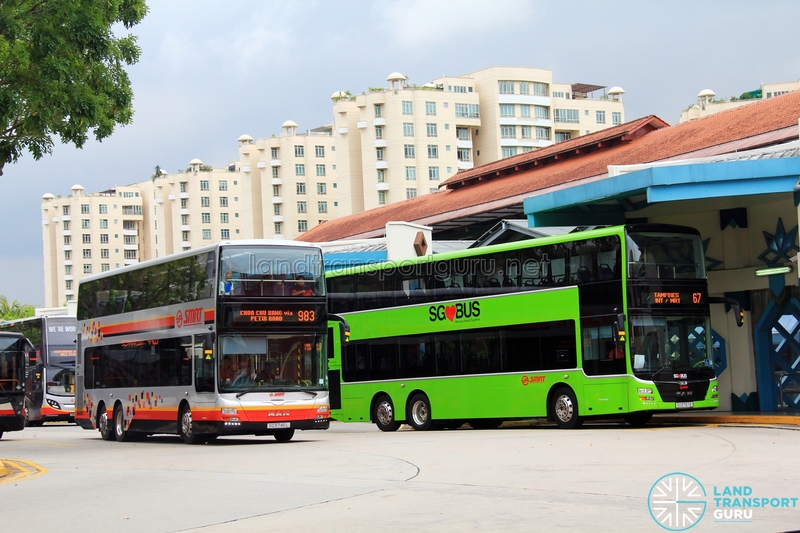 Subsequently, more MAN A95 buses were leased to SBS Transit. 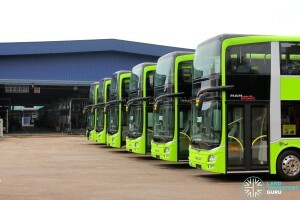 Go-Ahead Singapore also began leasing MAN A95 buses in January 2018. Singapore adopted the Euro 6 (or Euro VI) standards for all new diesel vehicles registered in Singapore from 1 January 2018, representing the latest in emission standards. As such, new buses which were registered from 2018 had to comply with the more stringent emission standards. SG2017C’s unique registration plate commemorates the conclusion of the 5-year Bus Service Enhancement Programme (BSEP) initiated in 2012. 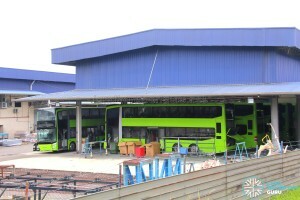 It is the 1000th bus to be delivered under the BSEP, as well as the first Euro VI Diesel bus in Singapore. 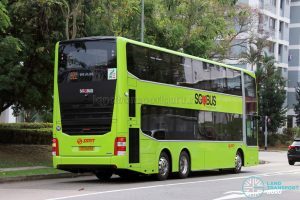 On 30 November 2017, SG2017C, was registered and leased to SBS Transit. Engine combines Exhaust Gas Recirculation (EGR) with Selective Catalytic Reduction (SCR), hence requiring diesel exhaust fluids such as AdBlue. Meets the latest Euro VI emission standard. 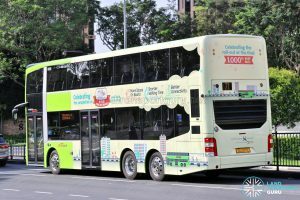 At launch, the bus was decorated with a unique advert wrap commemorating milestones achieved during the 5-year Bus Service Enhancement Programme (BSEP). While appearing similar to normal MAN A95 buses, it is distinguished by a ‘Euro 6’ badge near the front entrance door. As part of the Bus Contracting Model, the Land Transport Authority (LTA) is has initiated further purchases of MAN A95 buses. 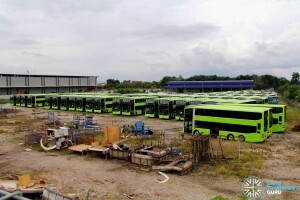 These buses are of the Euro VI specification and are bodied by Gemilang Coachworks with the facelifted MAN Lion’s City DD bodywork. In compliance with new LTA specifications, buses are equipped with Passenger Information Display Systems (PIDS) and two wheelchair bays. 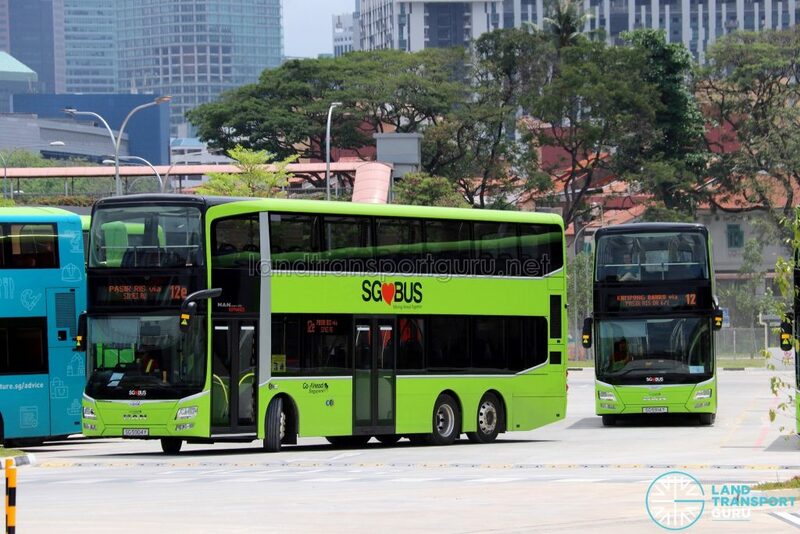 The first of these buses were registered SG5921Y – SG5926J on 22 May 2018 and leased to SBS Transit. All six buses made their revenue service debut on 27 May 2018, operating on Service 851e. 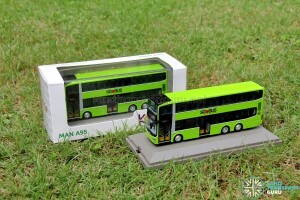 A prototype MAN A95 in Lush Green made its debut appearance at LTA’s Our Bus Journey Carnival at Ngee Ann City. 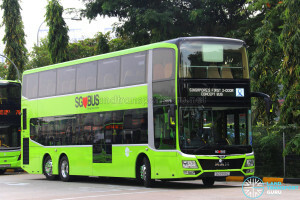 The bus is one of two concept buses commissioned by LTA to provide the public with a glimpse of how buses would look like in the future, the other being an Alexander Dennis Enviro500 MMC (2015 Facelift). The concept bus features three doors and two staircases, with new features such as seats with headrests, USB charging ports, stylish interior lighting and a Passenger Information Display. For more information, visit the MAN Lion’s City DD L Mock-up Bus article. From 13 March 2017, the bus embarked on revenue service trials on Bus Service 143, operated by Tower Transit Singapore. It marked the start of a six-month trial by the Land Transport Authority (LTA) to evaluate the suitability of such a bus design for Singapore’s use. 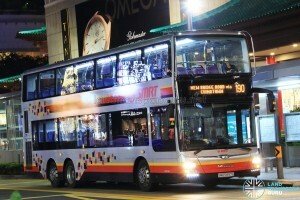 For more information, visit the LTA evaluates 3-door MAN Lion’s City DD Concept Bus article. 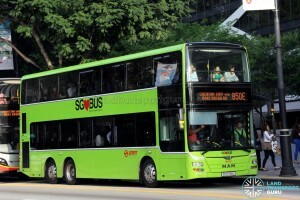 MAN Lion’s City DD L Concept Bus (SG5999Z), operating on Tower Transit Service 143. The steerable tag axle is evident as the bus navigates tight corners. 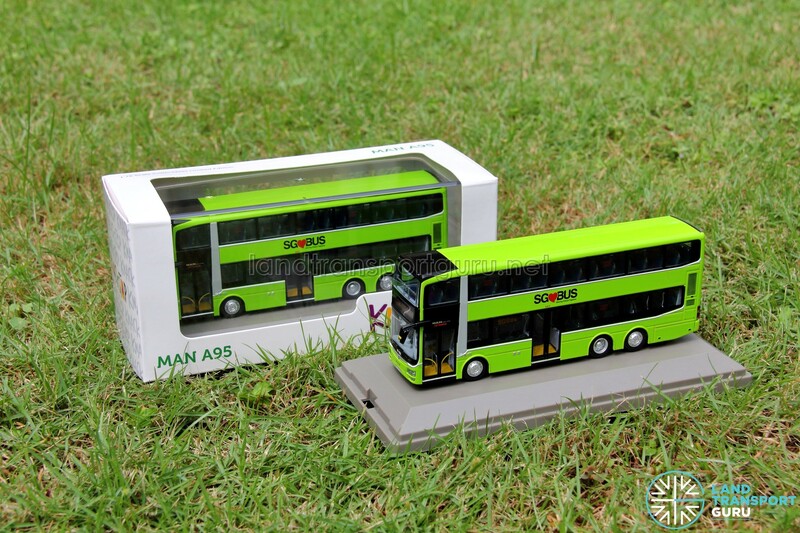 On 21 June 2017, Knackstop launched the “Singapore Bus Model”, featuring a Lush Green MAN A95 bus. 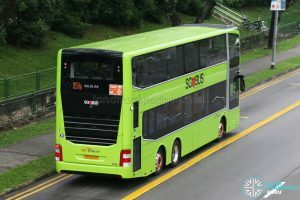 Marketed as the “Singapore Bus Model”, the bus is decorated with the Lush Green livery and SG<3BUS decals, but without any operator logo. Knackstop, a retail arm set up by the Land Transport Authority (LTA), sells a collection of public transport-inspired keepsakes and souvenirs. 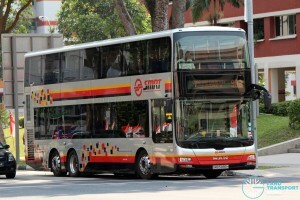 The “Singapore Bus Model” is its first die-cast bus model to be put on sale, retailing at $92. 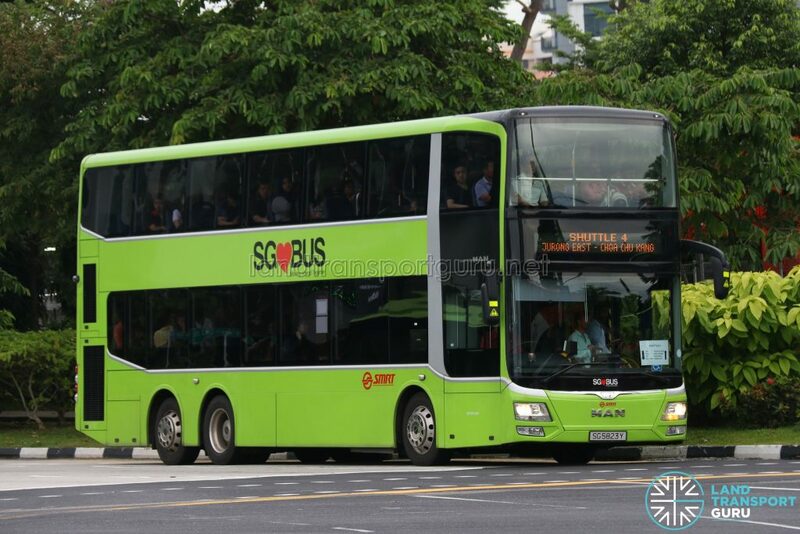 SG5914T was spotted doing route training at New Bridge Rd Terminal and Pasir Ris Interchange, likely training for deployment on services 12 or 12e, the EDS was formatted with Go-Ahead Singapore’s route training scroll and operator stickers have since been pasted. Later batches more likely to post to SBS. A small number had gone to BN,HG and SL besides SE/AMK. for fleet upgrades.